The Diocese of Melanesia includes many islands spread over an area of roughly three-quarters of a million square miles in the Western Pacific: in the South, islands of the new Hebrides group, and to their North the Banks and Torres Islands; 700 miles further North the Solomon Islands; to the East the Santa Cruz and Reef Islands groups. Most of the islands are covered with scrub and bush trees, with coconut palms near the sea shore. The first impression on approaching is of a mass of rich vegetation covering the hills, which rise steeply from the coast and may be capped in cloud. A nearer view reveals a few leaf houses grouped along the beach. The sea is the great highway. 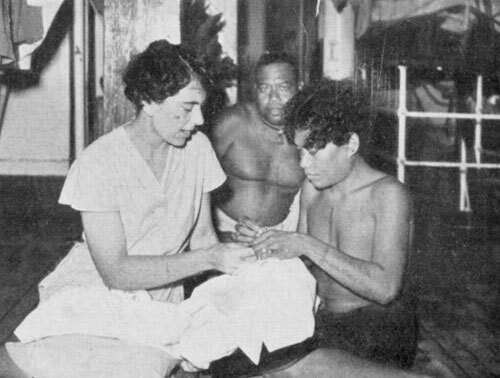 The Melanesia Mission carries on its work by means of a small motor vessel "Southern Cross" (at the time of writing a fund is being raised to replace No. VII, which went out of commission in 1954) and a fleet of some half-dozen launches. Ships and planes from Australia call at the main ports, Vila in the New Hebrides and Honiara in the Solomons, perhaps once a month or more. The people themselves continue to use plank and dug-out canoes, though launches are becoming increasingly common, particularly in the New Hebrides. Melanesians are brown skinned, short of stature and have fuzzy black hair brushed upwards. The total population on an extremely rough estimate is 144,000 and the majority live in small villages. Of course conditions vary greatly from place to place, so let us consider Malaita, one of the larger of the Solomon Islands. Its population of [2/3] 50,000 is nearly half that of the Solomon group. On this one island there are five different languages and many dialects. There is a sharp distinction between the coastal people and the bush people, who live up in the hills. The coastal man is virile and generally busy about something. Fishing is his main occupation, though he may go to work for a term on the coconut plantation. At night it is a pretty sight to see the people carrying flaming coconut fronds to the reef to look for shell fish. On one tiny island off the coast the making of shell money is quite an organised industry. From time to time porpoise hunts are organised. The teeth are used as currency, ten to a shilling, especially for the payment of the bride-price. This is still customary in many of the islands, and though it is not forbidden by the Church, an attempt is made to regulate the amount, as an excessive bride-price brings problems. The bush man is a more dour type. Life in the bush is more difficult than on the coast--the gardens are made on the sides of hills and water must be carried from the streams or rivers. The bush folk trade with the coastal people for fish and salt, a welcome addition to their otherwise monotonous diet. Life is simple and it can be hard. The men clear the ground, felling and burning the trees and build houses of wood and leaf. The women tend the gardens, planting and weeding and bringing home the produce, sometimes with the help of the older men. The older children help to look after the younger ones and they all go off with their parents to help in the gardens. Fishing nets, bags, mats, canoes and boats are made. In the morning and evening all sit round in the family house for a meal of vegetables, often potatoes and cabbage, sometimes fish, or, very rarely meat. Evenings are often spent in hymn singing. The day usually ends with talk, or "story" as they call it. Morning prayers are just after daybreak and the evening service comes about 5.30 just before the evening meal. Most people attend [3/4] these daily services, which are taken by the village catechist. When the district priest (a Melanesian) visits a village, there is an evening service of preparation followed by the Holy Communion early next morning. Feasts, always accompanied by dancing and sometimes by play acting, are held at religious festivals and weddings. The Melanesian Mission was founded in 1849 when George Augustus Selwyn, first Bishop of New Zealand, visited these islands, then included in his vast diocese. John Coleridge Patterson joined him a few years later and was consecrated first Bishop of Melanesia on St. Matthias' Day, 1861. For ten years he travelled from one island to another carrying the "good news" and seeking permission to take boys away to school. Here the lads were trained and grounded in the Faith. They and their successors, girls now as well as boys, the products of the Mission schools, have been evangelists, spreading the Gospel and establishing Christian communities in the heathen places where murder, [4/5] cannibalism, head-hunting and raiding were rife. There are many stories of the endurance of Christian villages in face of the ever present danger of attack. Near a river on Malaita is the place where the first native evangelists were killed, and down by the beach the district school teacher, son of a cannibal, will point out the site of the Church where services could only be held with armed sentries posted outside. Bishop Patterson was murdered on the island of Nukapu in the Santa Cruz group on 20th September, 1871, in revenge for the loss of five islanders who had been stolen away by the labour recruiting vessels, the "blackbirders" of evil repute. The anniversary of his death is a red letter festival celebrated with thanksgiving, feast and dance, for the seed which he and those who followed him have planted has borne abundant fruit. Nevertheless there remains the challenge of much still to be done, and of new needs to be met in the changing circumstances of today. During and since the war fresh influences and opportunities have come to these people, who are awakening to a new consciousness of themselves as a race and a new desire for independence. These developments are natural and right, but it is essential that they should be guided along the Christian way. Failure to do this could mean disaster. In the heathen society a woman might, and some did, wield considerable influence in her home and perhaps beyond, particularly an older woman or one of the "blood royal"--the old society was strictly ordered and was headed by an hereditary chief. Nevertheless her life was generally grim; regarded as little more than a chattel and the provider of food by her menfolk, her position was inferior and could become intolerable. In some places widows were compelled to carry the skulls of their dead husbands; they were prohibited from washing for one or two years. Women had to leave their home village and go by themselves into the bush at [5/6] the time of child birth, and remain there for a period of weeks afterwards, when they were "tabu." Polygamy was practised. In places infanticide was common. Filth and squalor characterised the houses and villages. The Christian view of the dignity of womanhood gained ground only very slowly. It has always been the Mission's policy not to force changes. Gradually as the meaning and the fullness of the Christian life is grasped, the old ways are seen to be unworthy and are left behind. Many forms of adornment exemplified this--at one time only a heavily tatooed or scarred woman would fetch a good bride-price. But settled ideas and prejudices die hard. Effective work among women came comparatively late in the mission's history. 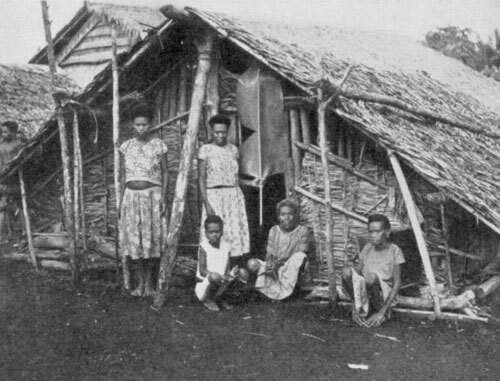 The first woman missionaries settled in the islands in 1905, and of course, a beginning was made. In 1916 two women missionaries started a girls' school, with only five pupils. The work of educating women started in this small way, has grown, and now there are three flourishing boarding schools for girls, one of which concentrates on mothercraft training for the seniors. They take a total of over 200 pupils. A general education is given with special training in the domestic arts, which will help them to lead a full life and be good home-makers. They are taught to sew and launder, to develop their own traditional handcrafts--weaving and plaiting in grass and leaf-and to put them to new uses, and they spend each afternoon in the gardens producing food for the schools' use and learning improved methods of cultivation which will enable them to produce more and better food for their families. Malnutrition and poor diet has contributed very largely to the wide-spread ill health of the people, more particularly in infancy. Many babies are weak and sickly; infant mortality was 40 per cent. In the past women have had no knowledge of how to feed their babies if they were unable to suckle them, and orphans inevitably died. A "side-line" at the girls' schools and hospitals is the care of orphan babies, who are kept until the age of about 14 months, when they are strong enough to go to their families. The school girls have the opportunity of gaining practical experience in the care of babies, and are taught to prepare suitable foods from the roots and fruits of the islands. Incidentally the presence of a small nursery adds much to the happiness and life of the station. School children are trained in cleanliness, hygiene and an orderly routine life, a novel contrast to the casualness of their old home life, but one that they soon grow accustomed to and enjoy. Senior girls at the mothercraft training school are prepared for Mothers' Union membership, so that when they leave and marry they are ready for admission and in many cases are able to take a leading part in the development of existing Branches or the formation of new ones. Girls trained at these schools can do much to raise the standard of village life, by passing on what they have learnt. The training of nurses began during the last war and is now a regular and most fruitful part of the Mission's work. The course lasts three years and includes special instruction in village hygiene and preventive medicine--very important part of the district nurses' work. The two training schools, at Fauabu and Lolowai Hospitals, are full and there are already qualified, certificated nurses at work. Some are staff nurses at Mission and Government hospitals, some are doing district work, not all on their own home islands, a few are running dispensaries (one at Siota serves the Theological College as well as the surrounding district), and three are taking a further midwifery course. 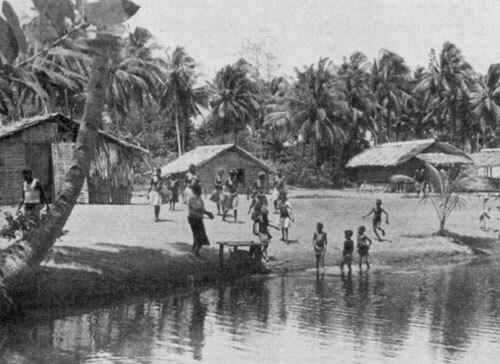 Many patients within walking distance (and this means anything up to 12 or 15 miles) come to the hospitals and dispensaries as out-patients, particularly for the treatment by injection of yaws, an almost universal disease which causes great suffering, debility and sometimes severe crippling and [8/9] for ante- and post-natal care and advice. Much of the nurse's time is taken up by travelling round her district and it is there that she finds the greatest need--people weakened by parasitic infections, suffering acutely from severe sores, too apathetic or fearful to seek treatment, or else beyond the reach of help. As the villagers return from their gardens in the evening, some pathetically crippled may be seen trudging wearily home with their loads of firewood and garden food on their backs or heads. What of the Mothers Union? 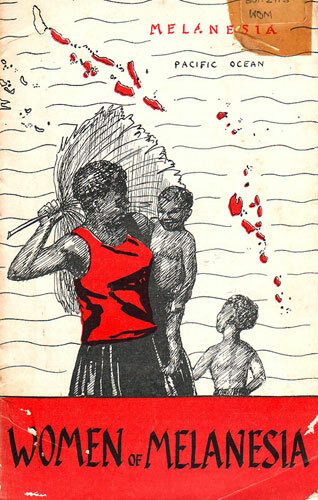 The Mothers' Union was founded by Mrs. Sprott on the island of Santa Ysabel and by Mrs. Mason on the island of Malaita in 1930 and 1931. Flourishing Branches developed in both places, which proved well able to carry on alone without the help of white leaders when these ladies had to leave. The ordeal of war and Japanese occupation was endured and still the work has gone on steadily and quietly; meetings held, regular corporate and family prayers conducted and a succession of new members prepared for admission. Three faithful women, early members trained by the founders, have continued the work during the years and inspired others with the ideals they hold--Rosana died a few years ago; Clara, her sister-in-law, wife of an outstanding priest of Santa Ysabel, died in old age in 1955. Catherine continues to lead the work on Malaita. The development of the Mothers' Union has helped to transform the lives of the people, not only in the outward appearance and cleanliness of their houses and villages, important as that is. Through it the faith of the women has been strengthened and they have been brought to realise and respond to God's call to them to give of the best in His service. Preparation for admission is given by a long and careful course of instruction, that each member may thoroughly understand the Christian ideals of marriage, motherhood and home life. The Service of Admission is conducted by the Bishop when possible, and is held at a centre where several [9/10] surrounding Branches gather. There may be as many as two hundred mothers to be admitted, and for each it is a great day. Slowly the procession enters the church and then, when the solemn promises have been made, it files out again headed by the crucifix and the banner bearers of each Branch. At Buala each new member was given a lily which she planted beside the church path. The Branch grew and the paths became bordered with lilies up to the church door. The Union has been established in other centres--for many years there has been a Branch at Lamalaña, Raga, under Miss Fagan. In 1950 she was called away to fill a sudden vacancy elsewhere. On her return some two years later she found all in order, meetings continuing, new members ready for admission, Agnes Bomare having effectively assumed the leadership. Numbers and distance made it desirable that this Branch be divided and a new one has been started under the Rev. David Teve and his wife, the daughter of the first priest of Raga. In 1951 preparations were made to start a new Branch at Kerepei on the little island of Ugi. 45 women were being prepared and lessons, prayers and special services were translated for their use by a priest at the senior School, also on Ugi. Work was interrupted by a poliomyelitis outbreak, when all meetings had to be suspended, but later routine was resumed and in due course the first members were admitted. Leaders and members must contend with many difficulties. Since they live in small and scattered communities, many must walk considerable distances to attend meetings. Some of the prospective new members of the Kerepei Branch walked 12 miles each way every week for the preparation classes. When Festivals and Corporate Communion services are held at such centres as Buala, Santa Ysabel, many come from such a distance that they walk in the previous night, bringing their bed rolls and food with them. Torrential rain [10/11] and violent storms are common in this tropical diocese and do not ordinarily deter these women, but recently a meeting had to be abandoned because nothing could be heard above the din of the rain beating on the iron roof. The multiplicity of languages is a special problem. Corporate Communions are sometimes held in two languages part in one and part in the other-in an attempt to overcome this. The difficulty is particularly acute at Honiara, "capital" of the Solomons, for here most of the Melanesian population are people who have come to work for the Government for a term of two or three years and then will return to their homes. Only a few of these are able to bring their families, but the wives who are there belong to an M.U. Branch run by the wife of the Rector of Honiara. Coming from many different islands, they speak many languages. The only solution is the use of very simple English and progress is correspondingly slow. It is difficult to provide enough books or even simple instructional leaflets in the different languages for those who can read, though the Mission Press, re-established in 1952 in the Solomons, is working to capacity. To fill a gap, lessons were typed in Mota for use at Lolowai until printed copies could be supplied. Not all the women have been to school, indeed the number who have is regrettably small so far and many are still illiterate. The Church's task is to raise up the "whole man", spiritual, mental and physical and the Mothers Union is playing a large part, for the women's share is fundamental The building up of a Christian home is a paramount duty of the Church and this can best be done by instructing her young people in the Sanctity of Marriage--a Sacrament of the Church--that Marriage must not be taken in hand unadvisedly, lightly or wantonly, but "for the mutual society, help and comfort that the one ought to have of the other, both in prosperity and adversity", and, if they have "the heritage and gift of children", to see that they are Christianly and virtuously brought up; in fact to make the blessed Home of Nazareth their pattern home. [back page] WHAT CAN I DO? Remember the Wave of Prayer every day at noon. Take my share in helping to keep the link between my own Branch and the link Overseas allotted to us. Make a contribution, however small, to the Overseas General Fund. Take a collecting-box or a Thanksgiving envelope and try to fill it. £30,000 per annum is needed if present work is to continue and further Mothers' Union workers are to be sent out into the Mission Field throughout the world.